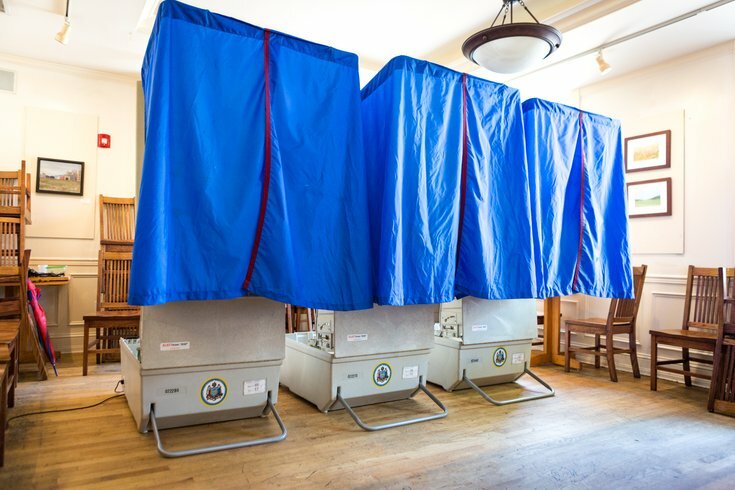 Voting machines at a polling location in the dining room of The Gold Standard Cafe on Baltimore Ave. in West Philadelphia on Tuesday, May 15, 2018. Hundreds of Philadelphians signed a petition earlier this week in hopes of getting SEPTA to offer free rides this Election Day, but the transit agency has answered with a resounding "no." The petition, created by the 5th Square Political Action Committee, gathered hundreds of signatures after going live on Tuesday, sighting multiple other large cities that offer free transit to make it easier for people to get to their polling places. "Let's join other major cities including Dallas, Houston, Tampa, and the Twin Cities and offer complimentary public transit on election day," the petition reads. "Let's help Philadelphians make a voting plan that includes SEPTA." The petition also references a recent survey out of Tufts University that shows one-third of young people of color who didn't vote did so because of lack of transportation. Twenty-seven percent of young white non-voters also cited the same problem. Lisa Deeley, chair of the Philadelphia City Commissioners, told WHYY that public transit access in Philadelphia isn't as much of a voting barrier. "We're bound by a consent decree, so most of our polling locations are within a five-block radius," Deeley told WHYY. Last month SEPTA began offering some free rides to align with the Philadelphia Eagles game schedule, though only on the Broad Street Line for either a full day or a few hours. WHYY said the free BSL access cost the agency between $25,000-$30,000. The cost of free rides on all SEPTA platforms for a full day could reach beyond $1 million, WHYY calculated. Free transit for Election Day was cemented in 14 other cities in 2016 following 2012's low voter turn out.